Equipped with an inverted automatic winding mechanism, the Panthère au Clair de Lune de Cartier features a free-spinning panther set with jewels that animates the dial while winding the movement. 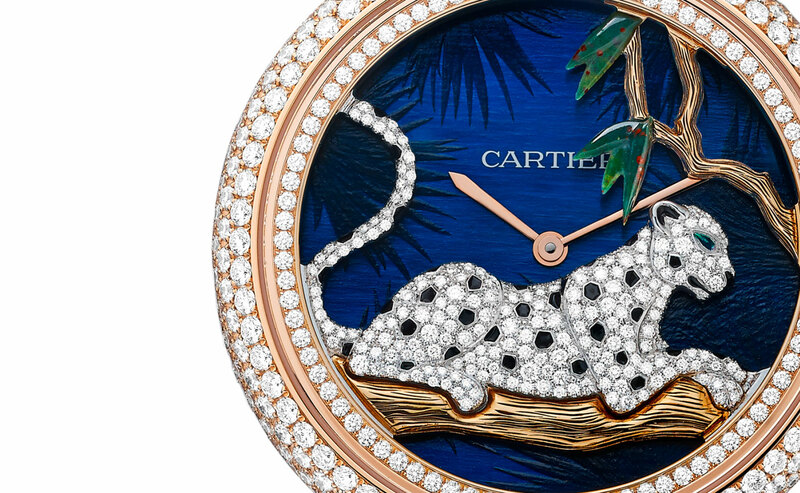 Cartier’s Fine Watchmaking line often combines technical innovation with whimsy, a formula exemplified by the Panthère au Clair de Lune de Cartier that will soon be officially launched at Watches&Wonders 2014. Powered by the 9603 MC movement, the Panthère au Clair de Lune de Cartier has an unusual peripheral winding mechanism, with the bejewelled panther over the dial as the oscillating weight. Developed in-house by Cartier, the 9603 MC was conceived by the talented Carole Forestier, likely the only female technical development leader at a major watch brand. 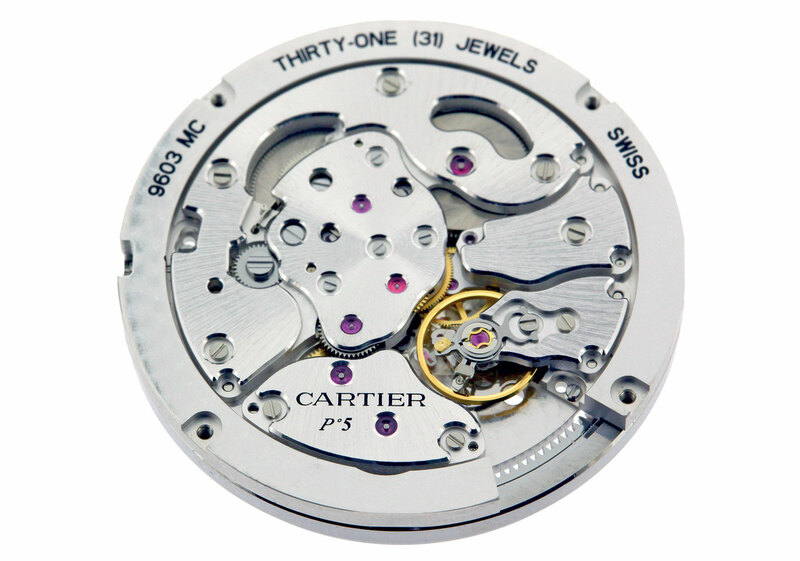 The 9603 MC has peripheral winding mechanism with an inverted rotor. This leaves the movement entirely unobstructed when viewed from the back. But what makes it intriguing is the position of the oscillating weight, which sits over the dial. It does not touch the dial, instead it is mounted on the edge of the dial on ceramic ball bearings and linked to the winding gears via a large, toothed wheel around the dial. This movement was first introduced in 2012, but now makes its comeback with greater extravagance than before. Set with diamonds with black lacquered spots, the panther is made of white gold, while the branches of the tree are rose gold. Green jasper is used to form the tiny leaves. The 42.75 mm case is in rose gold, as is the bracelet. In total the watch is set with over 20 carats of diamonds. 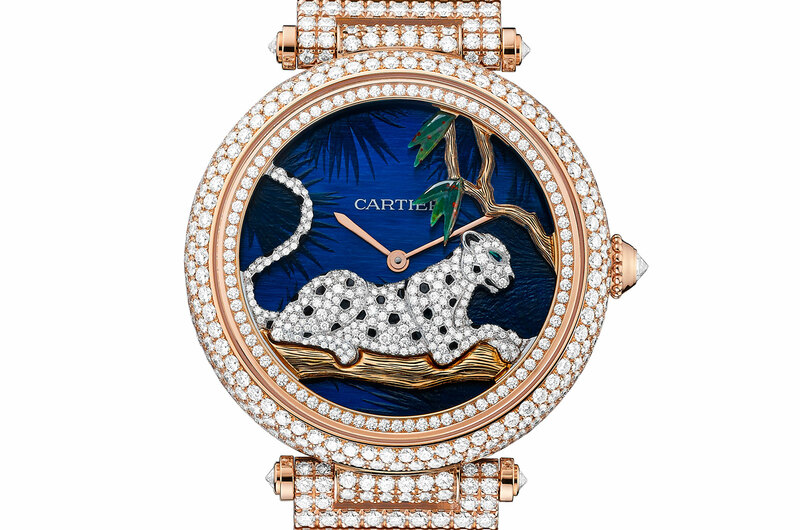 The Panthère au Clair de Lune de Cartier will be a limited edition of an undetermined size with a price of 535,000 Singapore dollars, or about US$428,000.